WEB2DNA is just mind-boggling. I made it one Saturday afternoon because I was feeling bored and rather silly. I never imagined that people would actually use it. I was wrong, it has been huge success. Every month WEB2DNA is ranked the most popular page on this site. It has converted 323.648 websites, and it has been used by more than 250.000 people. 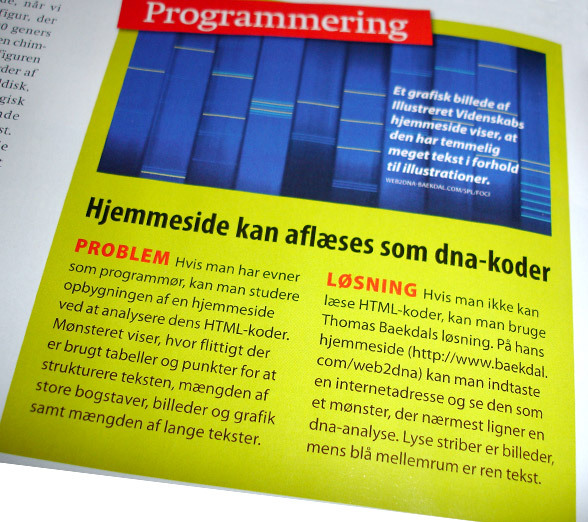 WEB2DNA has also been featured on a lot of websites and in several magazines. I am absolutely stunned - and I really grateful!